Back by very popular demand- Books Like Downton Abbey! This has been our most popular series- check out the prior posts here. Downton Abbey Season 4 starts on January 5th, 2014. I am excited that Paul Giamatti will join the cast as Cora’s American brother. And, Shirley MacClaine will return. I adored it when she sang to Maggie Smith- priceless! Lucinda Riley is one of Great Thoughts’ favorite authors. She and her books are delightful. 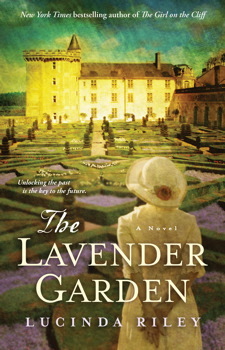 Her newest book, The Lavender Garden, is no exception and it “feels” like Downton Abbey. From the publisher, “An aristocratic French family, a legendary château, and buried secrets with the power to destroy two generations torn between duty and desire. La Côte d’Azur, 1998: In the sun-dappled south of France, Emilie de la Martinières, the last of her gilded line, inherits her childhood home, a magnificent château and vineyard. Paris, 1944: A bright, young British office clerk, Constance Carruthers, is sent undercover to Paris to be part of Churchill’s Special Operations Executive during the climax of the Nazi occupation. Separated from her contacts in the Resistance, she soon stumbles into the heart of a prominent family who regularly entertain elite members of the German military even as they plot to liberate France. .
Simon and Schuster provided a digital review copy of this book. All opinions are my own. This book too resembles Downton Abbey and I thoroughly enjoyed it. Rutherford Park easily could be Downton and Mr. Bradfield, the butler, could easily be Carson. This is a wonderful read that should be on your Downton Abbey reading list! Lady of the house Octavia Cavendish lives like a bird in a gilded cage. With her family’s fortune, her husband, William, has made significant additions to the estate, but he too feels bound—by the obligations of his title as well as his vows. Their son, Harry, is expected to follow in his footsteps, but the boy has dreams of his own, like pursuing the new adventure of aerial flight. Meanwhile, below stairs, a housemaid named Emily holds a secret that could undo the Cavendish name. Ok, now that you have read this far, you deserve a treat- Shirley singing to Maggie, courtesy of PBS- Enjoy! Watch Downton Abbey: Maggie Smith, Queen of the Double Take on PBS. See more from Masterpiece. Don’t faint, but I’ve never seen a single episode of Downtown Abbey. I never really heard of it until last year and then I just don’t understand what it’s about. At the moment I’m not reading anything but last week I finished up Laurel Hamiltons recent book. I’m reading the Orchid House by Lucinda Riley on my 14 hour drive to Florida for vacation! I will have to down load the Lavender Garden for my ride home! I am also hoping to read Spring Awakening by T.J. Brown while on the beach!! Thanks for the recommendations! !